Leonie the leopard shark has made a switch that could save her species - becoming the first shark recorded to change from sexual to asexual reproduction, researchers have found. Christine Dudgeon of University of Queensland in Australia said sharks could reproduce without a mating partner, but none with a recorded sexual mating history had ever made the change to asexual reproduction. She documented the change at Reef HQ Aquarium in Australia. "Leonie had pups with a male leopard shark until 2013, when the breeding pair were separated for space reasons," said Dudgeon. "In April 2016 Leonie hatched three eggs, despite having no access to a mating partner for three mating seasons," she said. "We thought she could be storing sperm but when we tested the pups and the possible parent sharks using DNA fingerprinting, we found they only had cells from Leonie," she added. 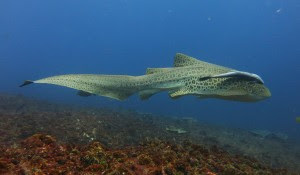 It is a much-needed breakthrough and coincides with release of the International Union for Conservation of Nature (IUCN) Red List of Threatened Species which identified the leopard shark as an endangered species. "This has big implications for conservation and shows us how flexible the shark's reproductive system really is," said Dudgeon. "Leonie adapted to her circumstances and we believe she switched because she lost her mate. What we want to know now is could this occur in the wild and, if so, how often does it?," she said. "One reason why we have not seen it before could be because we have not been looking for it. It might be happening in the wild but it is never been recorded in this species before," she added. Dudgeon plans to follow the pups until they reach maturity to answer the big question - can these asexually produced leopard sharks have pups of their own with a male partner? "You lose genetic diversity with generations of asexual reproduction, so we will be seeing if these offspring can mate sexually themselves," said Dudgeon.